Week 3 of the 2019 MLS season saw DC United shutout Real Salt Lake 5-0 at Audi Field and FC Cincinnati win their home opener. Seattle extended their run of form once again with help from Jordan Morris and Minnesota lost in Carson. 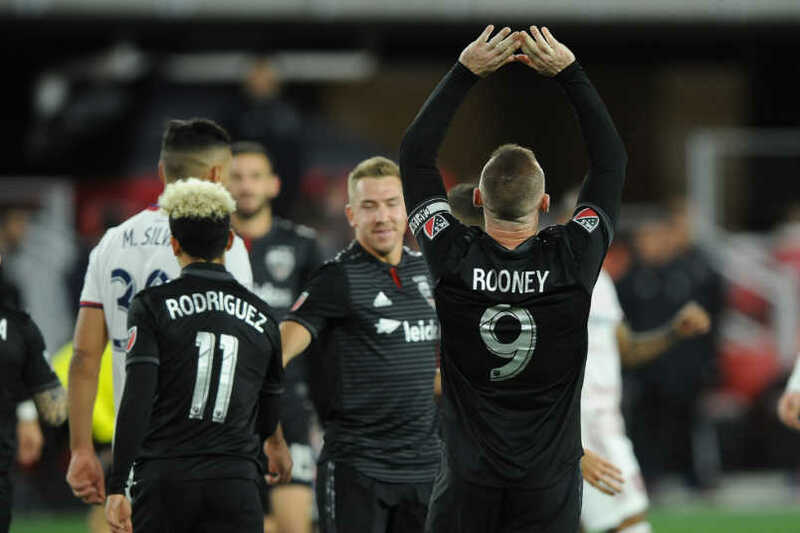 Wayne Rooney had a hat-trick in DC's 5-0 win over RSL, converting a 34th minute penalty and scoring in the 41st and 65th minutes. RSL went a man down with a red card to Jefferson Savarino in first-half stoppage time for a serious foul. Marco Silva followed with a red card for unsporting behavior in the 67th. Rooney assisted on Lucas Rodriguez's goal in the 76th with Ulises Segura scoring in the 80th. DC goalkeeper Bill Hamid made two saves to keep the clean sheet. “Chemistry is on another level right now," Hamid said. "We went about things the right way today. We didn’t lose our heads, stayed calm, and it paid off." FC Cincinnati retained the Nippert Stadium advantage, winning their first MLS home game 3-0 over Portland. Kendall Watson scored for Cincinnati in the 15th with Allan Cruz doubling the lead in the 61st. Mathieu Deplagne scored in the 63rd minute. Portland's Larrys Mabiala saw red in the 70th minute. Spender Richey needed three saves to keep the clean sheet. Seattle beat Chicago 4-2 on the road. Jordan Morris assisted on Victor Rodriguez's goal in the 8th minute and scored in the 15th. Nicolas Lodeiro assisted on Morris's goal, converting from the penalty spot int he 49th. Chicago came back with goals from Raheem Edwards in the 56th and Fabian Herbers in the 84th. Raul Ruidaz scored Seattle's fourth goal in the 88th minute. Chicago finished with 12 shots on goal to Seattle's 7. "I think today we were beaten by a better team," Chicago coach Veljko Paunovic said. "I think they opened the match with a very good couple of actions. They converted their opportunities immediately and that affected our confidence.... "But, at the end of the day, I think we lost the game because of our mistakes and it's my responsibility, obviously." Columbus shutout FC Dallas 1-0 at home. Gaston Sauro scored the game's only goal in the 10th minute. Zack Steffen kept the clean sheet with two saves. "I think we improved some things in the second-half, we had more of the ball, more movement, more passing and we created some chances and it was better but it wasn’t good enough," Dallas defender Matt Hedges said. Houston beat Vancouver 3-2 at BBVA Compass Stadium. Memo Rodriguez put Houston up in the 15th minute with Fredy Montero equalizing from the penalty spot in the 35th. Alberth Elis converted a Houston penalty in the 42nd. Lass equalized for Sporting in the 54th with Rodriguez scoring Houston's winner in the 73rd. The New York Red Bulls came back to beat San Jose 4-1 at Red Bull Arena. Cristian Espinoza scored for San Jose in the 5th minute. Alex Muyl equalized for New York in the 51st, scoring again in the 71st. Bradley Wright-Phillips made it 3-1 Red Bulls in the 85th with Daniel Royer scoring in the 89th. "We had two games in one," San Jose coach Matias Almeyda said. "The first-half was excellent, and the second-half was bad against an unforgiving team. They've been working together for five years now and have an established style of play. We are looking to win, establish our playing style and build mentality. It's going to take a while." Montreal beat Orlando City 3-1 on the road. Orij Okwonkwo put the Impact up in the 14th with Ignacio Piatti scoring in the 15th and 80th minutes. Dom Dwyer scored for Orlando a minute into stoppage time. City finishing a man down with a red card to Zakaria Diallo for violent conduct six minutes into stoppage time. The Galaxy beat Minnesota 3-2 at home. Jonathan Dos Santos converted a penalty in the 36th minute with Chris Pontius doubling the LA lead in the 41st. Jan Gregus pulled a goal back for Minnesota in the 75th with Sebastian Lletget making it 3-1 Galaxy in the 81st. Angelo Rodriguez scored for Minnesota in the 87th minute. NYCFC and LAFC drew 2-2 at Yankee Stadium. Alexandru Mitrita put NYCFC up in the 39th with Carlos Vela equalizing in the 43rd. Alexander Ring returned the NYCFC lead in the 62nd with Vela equalizing from the penalty spot in the 76th minute. Atlanta's issues continued with a 1-1 draw with Philadelphia at home. Brendan Aaronson put the Union up in the 47th minute with Ezequiel Barco equalizing in the 70th. Toronto FC came back to beat New England 3-2 at BMO Field. Carles Gil converted a 9th minute penalty to give the Revs the lead. Ayo Akinola equalized for Toronto in the 14th with Jordan Hamilton scoring in the 45th. Gil equalized in the 52nd. Jozy Altidore subbed on in the 68th minute and scored Toronto's winner in the 80th. Week 3 ended in Colorado with the Rapids drawing 1-1 with Sporting KC. Diego Rubio put the Rapids up in the 54th. Colorado went a man down in the 87th with a red card to Johan Blomberg. Johnny Russel equalized for Sporting a minute later.